It never ceases to amaze me how the day can go by so fast. But again another day is coming to a close. 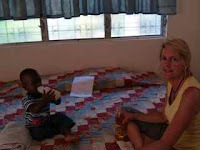 Jussi is having a ti domi (little nap) and T Mac is playing with a toy on the bed, just having some downtime with Nana. Many of the families in Port live in tent cities, some in large army style tents, some in small homemade tents made with tarps, Rotary Shelter boxes, Red Cross and World Vision and every NGO that you can think of. What really has struck me is how they look somewhat un-inhabited by day but in the evening after all the people finish selling their wares, working or finding work, or just waiting for opportunities, return the cities come alive. 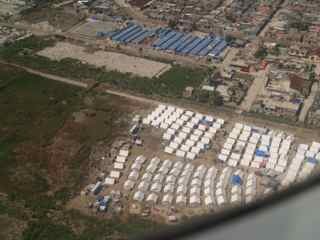 One small tent city is next door with our Haitian son Karly and his family. They have a family house, an old travel trailer, free of doors and windows, Shelter box tents, homemade structures laced with tarps, camping tents and everything else in between. I am astounded at the resisilence of the people. They are putting out laundry, raking, sweeping, organizing food, braiding heads of hair, bathing and watching over each others children. Many stories have been told in the last few days and I will write of the individual stories on the weekend. Now I want to talk about the rebuild, what is going on now and the pulse of the city. - people still need food..
- line ups take all day in the blazing sun and some never make it close enough to get anything so they return the next day in hopes to be further up the line. - And as always you can buy almost anything on the side of the road, including MANGOES. 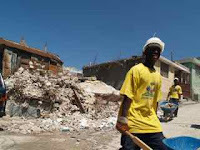 Today in Leogane, the epi center of the quake and one of the hardest hit areas, I took some pictures. 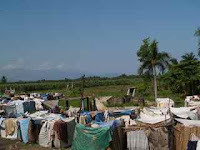 The pics show the other kind of tent cities, the non organized, tent cities made from bed sheets, banana leaves woven together and pieced together plastic. 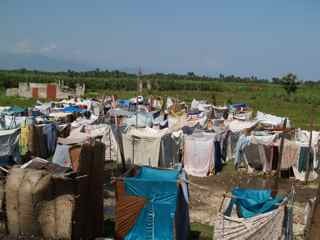 My heart is so burdened for these people, they have nothing left, all that they have fits in a tiny 5 x 5 shelter that is not waterproof and has water running all around them. My heart breaks for the lady I saw sitting outside the ruins of her house, it is a pile of rubble, a small tarp comes off one corner of the crumbled house and a small child plays on a mattress. She has a pile of mangoes in front of her for sale. I pray that I don’t take anything for granted including time, in seconds her life changed forever. I also cry for the images of those building that obviously people were trapped in, and if the story were told someone was saved, or someone was lost. The final images of the new shelters, we saw Helping Hands for Haiti signs, not sure the actual distributor. 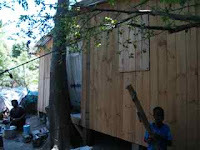 These houses are apparently just over $2000 USD per house and go up in two days, and they are pre fab pieces made here in Haiti. That is win win.